Like most boys of his era David grew up fascinated with man’s conquest of the stars, the rapid rate at which we had spread ourselves across the Galaxy in only a matter of decades, all thanks to the discovery of the Starlight Crystals. David soon turned his enthusiasm to technology and computer coding. Fascinated by the speed of computing with faster than light circuitry brought about by the starlight crystals, he devoted much of his spare time building and coding his own contraptions, much to the frustration of his parents and friends who would often not seem him for days at a time. Moving to the Ministry’s Space Academy on New Earth, he quickly progressed capturing the attention of several notable Ministry scientists. David also met Sarah; for him, he thought for the first time, but soon remembered pulling her hair at junior school. Soon David fell for her and suddenly the world of tech did not seem so interesting. David began to lose his interest, instead spending all his time with Sarah. But his rapidly decreasing grades meant very little as the Darkwave struck, destroying all the Starlight crystals and connected technology in a flash, including his old home district, killing both his parents. Escaping the panic and destruction, Sarah and David headed away from the decimated populated areas. 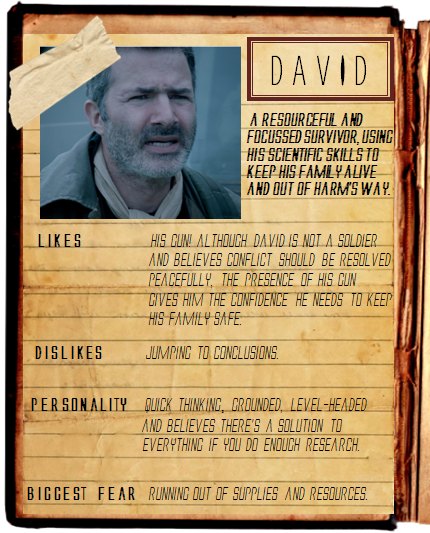 It was now that David’s skills came to the fore; piecing together broken computers, and machinery to make workable survivable solutions. Throughout the darkest of times, it was David that kept them both alive. Now a father to Ben and on the run as a fugitive, David remains more focused than ever, applying his skills, collecting data about the Darkwave, the Ministry and its military wing the Armada, trying to keep one step ahead.